Stephen Ervin is Director of Computer Resources and Assistant Dean for Information Technology at the Harvard University Graduate School of Design, and a Lecturer in the Department of Landscape Architecture. He is responsible for the school’s computer network infrastructure for CAD, GIS, Image Processing and Animation software, numerous research projects and an active World Wide Web site. Mr. Ervin teaches and conducts research in the areas of design, computing, media and technology, with a special interest in landscape modeling and visualization, and the integration of CAD and GIS. 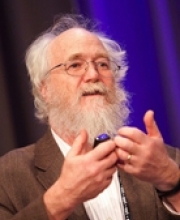 He has taught and lectured worldwide and published articles in a number of design and computer related journals. He was the founding chairman of the American Society of Landscape Architects Committee on Computers in Landscape Architecture. Mr. Ervin received a MLA from the University of Massachusetts at Amherst and a PhD in Urban Studies from the Massachusetts Institute of Technology.